Your Skin But Better CC+ Cream with SPF 50+: I have to start with the product that is synonymous with the brand. I have raved about this on the blog many, many times previously, and with good reason. I never believed that a CC cream could offer full coverage but this one really does. It's medium but can be built to full, if required, but I find that one layer will cover any redness and glide over my visible pores to blur the appearance. The finish is satin, almost dewy - perfect for every day wear and the SPF 50 is a real bonus. It feels hydrating on the skin but isn't at all greasy - just comfortable and lightweight. I already have a back up of this and know it will always be in my collection. Your Skin But Better CC+ Illumination SPF 50+: For those who have dull skin and want some extra luminosity, this version will be for you! It has the same colour correcting abilities of the original CC cream but the finish is more luminous. It looks a little shimmery when pumped onto the hand and I worried that it might translate as glittery on the skin, but thankfully it doesn't. It basically looks like you've added a small amount of highlighter to your base product. It also offers the coverage of the original so for those with dull skin that need some coverage without any heaviness or cake-like finish, I highly recommend this product. Bye Bye Under Eye Illumination Concealer: Being completely honest, I'm not a fan of the original Bye Bye Under Eye Concealer as I find it to be far too thick for my personal taste and it just seems to sink into every fine line and look very obvious under the eye. I expected to dislike this illumination version but I don't - in fact, I love it! Yes, it's quite thick but somehow it doesn't feel as heavy. The key is to use a very small amount initially and then more could be added, if necessary, but the coverage is full so I personally use no more than a pinhead amount under each eye. Because this concealer has illuminating abilities, I find that I really don't need to use very much and I definitely don't need to use a corrector underneath. It feels hydrating and looks so fresh and brightening in the under eye area that I think it's perfect for mature skin or anyone who has fine lines/wrinkles but also dark circles. A little goes a very long way with this concealer! Tightline Waterproof 3-in-1 Black Primer-Eyeliner-Mascara: This is a bit of a strange product! The wand is minuscule, which certainly means that you can get to the root of the lashes, giving the appearance of having tightlined but as a mascara, it does very little for my lashes. I like mascaras that add volume and a curl to my lashes but this just about defines them - nothing more. It's a bit of a pointless product for me but if you have naturally full lashes that only need a product to help define them, you might like to try this. Superhero Mascara: This is not in the photograph above but I have used 3 tubes of this mascara so I have to mention it after the disappointment of the last product. This mascara does everything - it lengthens, adds volume and gives that false lash effect that I love. It doesn't smudge or flake or make my lashes go crispy and the wand means that every lash is coated from root to tip. An all round winner! 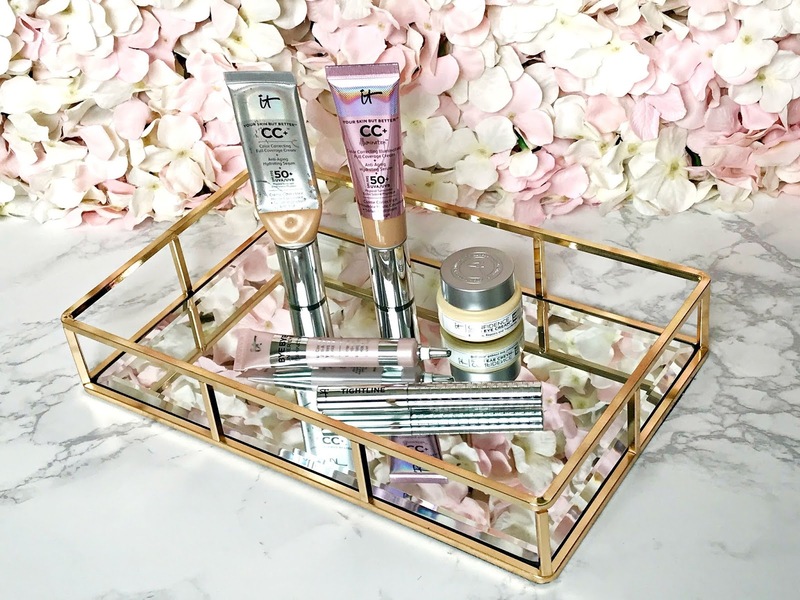 Confidence in an Eye Cream: I'll say it straight away - I love this eye cream! It's really nourishing and smoothing, yet it doesn't feel greasy or sit on the skin. It also doesn't cause any milia in the way that some nourishing eye creams do. It brightens the under eye area due to the apricot tint, which is perfect for no makeup days. I also find that my concealer applies well over it without any creasing or breaking down. Overall, my eye area looks fresh and plump, thanks to this eye cream. If anything in this post has caught your eye, don't forget that there is free international shipping on all IT Cosmetics orders on Cult Beauty this month! I would love to hear if you have any recommendations for me? I'm particularly interested to hear thoughts on their eyeshadows as I rarely see any coverage on them. All products are bought by me, unless otherwise stated. All products apart from the original CC cream were kindly sent to me. Opinion is always my own. Affiliate links may be used.